This month’s We Should Cocoa challenge (Hi there, Chocolate Teapot and Chocolate Log Blog!) is sugar free. At first I thought I’d skip it – the only recipe that came to my mind was one for berry & date chocolate truffles, and I’m a bit truffled out from the Christmas season (even though I only made three kinds of truffles and only ate about 80% of them myself). Also, TLSO is on a diet and asked me if I could maybe, perhaps, bake a little less so that there aren’t constant temptations around – I complied. However, two weeks into my baking strike I was developing severe withdrawal symptoms and started coming up with various cunning plans. Upon googling sugar free, low fat, low calorie etc. healthful-stuff recipes online, I came across the Paleo Diet, as well as a bunch of resourceful people who have come up with Paleo baking recipes! So, I asked TLSO: was it ok to bake a cake that had no sugar, no dairy and no flour in it, but plenty of good for you fruit? It was. Ta-da, I had both a diet-friendly and a cocoa challenge applicable chocolate cake recipe in my hands. The recipe comes from the Paleo Spirit blog, which has plenty of information on the Paleo diet and a lot of damn fine looking recipes. The cake is free of a whole bunch of things, like dairy, gluten, sugar, nut, and soy, but it is chock full of complex flavours that combine in your mouth to give you the sweet satisfaction of chocolate cake. The texture is dense and moist (because of the fruit), yet fragile (because of the heavy and sturdy coconut flour). Absolutely worth trying! Preheat oven to 175 C. Line the bottom of a 9” round cake pan with parchment paper and grease pan with coconut oil. Place the dates in a food processor and pulse until completely pureed (scrape the sides a few times to make sure there are no bits hiding from the blade!). Add applesauce and continue to pulse until combined with the dates. Transfer the fruit purée to a bowl, add the eggs, vanilla, coconut oil and coffee, and mix with an electric mixer until well combined. Slowly add the dry ingredients into the wet ingredients and mix on low-speed, scraping down the sides, until you have a smooth batter. Pour the batter into the prepared pan and smooth it with the back of a spatula (the batter does not settle like regular cake batters, so the pattern you make now is more or less the pattern that comes out of the oven). Bake in the preheated oven for 30-35 minutes or until a toothpick stuck in the middle comes out clean. Serve with whipped (coconut) cream or frosting of your choice. 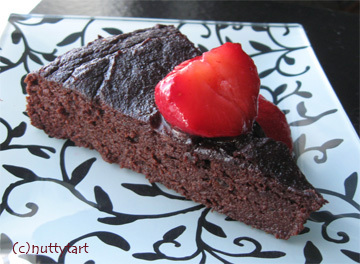 We had this with last summer’s strawberries (thawed from the freezer), which complemented the cake beautifully. I spotted this in the WSC round up. It looks delicious and sounds very tempting indeed. This looks fantastic! The first time I cooked with coconut flour I couldn’t believe how little you need in terms of volume, and how much it bulks up compared with regular flour. It’s a great kitchen cupboard standby for gluten free baking.